I've never understood why anyone other than its most recent tenants (squatters) gave a damn about the future of the Capital cinema. 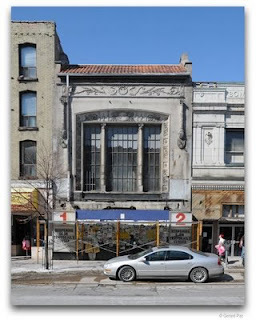 Of what use is an old cinema (with no cup holders in the seats) in a downtown people rarely visit? I recently noticed (like most Londoners, I rarely have any reason to go downtown so I can't say how long it's been visible) that there is an antique looking facade which had been hidden for years behind some unimpressive siding (siding which dated back to the days when people actually used the cinema as a cinema and removed in the process of demolition). At first, I really couldn't understand why anyone would want to put boring old siding over top of some sweet old architecture that I hear is worth saving at a cost of millions. So why wasn't this architectural feature visible before? Given the controversy surrounding this place, I was moved to investigate this recently revealed and rather disturbing facade more closely. I was so fortunate on this particular day as to have within my entourage, that seer of all things esoteric, Sargon the Magnificent. Having guessed the source of my distraction as we moved through the dust bowl of London, Sargon drew my attention to the iconography of the building. It seems the designer of this facade was, himself, either a seer of the highest caliber who saw what must have seemed unthinkable in the roaring 20s - within 100 years London's downtown would become a financial/cultural sinkhole - or he had a twisted sense of humour and an axe to grind with his patrons. For those of you who care enough about these sorts of things, go downtown and look carefully at the cornucopias which decorate this pollution-stained facade. I will not reproduce a detail of this image here; Sargon insists that everyone must see this for him/herself, and that reproducing the image here, in detail, is counter-intuitive. Typically speaking, a cornucopia is a representation of a goat's horn overflowing with fruits, flowers, and vegetables, used to symbolize plenty or prosperity. On this facade take note of what emerges - a snake! One need not have a postdoctoral in post-feminist transgressive literature to understand that you don't want a snake in your cornucopia. Now, having read of the sweet little deal the owner of this ominous little facade has in the works with city council, I asked of Sargon that age old question: "Does art imitate life? Or does life imitate art?" Sargon merely laughed that strange disembodied laugh of his and vanished into the dust bowl. Cornucopias represent what you want alot of. Snakes there, means lots of snakes. Snakes generally mean bad things, so it is an icon of bad luck. September 28, 2008 5:53 p.m.